Case Solutions - ACI Services, Inc.
Click on a link below to learn more about particular customer situations and needs, and how ACI implemented innovative solutions to meet these needs. For more detailed information on ACI solutions to any particular job, please contact ACI and indicate the job number (Case #, Customer). You may elect to use the ACI Search feature (shown below) to search for particular items. 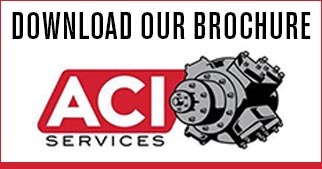 This list of key jobs is available to detail ACI’s expertise in the reciprocating compressor industry, and to give an overview of ACI’s innovative solutions to solve particular compression needs. This list does not constitute any endorsement of ACI by any of the companies listed. Customer had OEM cylinders w/o nameplates and no known pressure rating. This was considered a safety hazard. Driver is an I-R KVG and cylinders were non I-R but those of another OEM. Replacement cylinders with certified pressure rating and capacity, appropriate flange size and rating and suitable attachment adapter for existing I-R driver. Selected Cooper ductile iron cylinder with proper features, designed piston and rod assembly, bored liner to correct size and produced appropriate adapter. Reworked accessories such as packing and valves to supply fully remanufactured assemblies. Remanufactured cylinders provided ahead of customer’s schedule and they performed mechanically and thermodynamically in accordance with customer’s specs. Existing OEM’s gas transmission service failed in service. Structurally stronger, functional equivalent cylinder bodies with liners to replace failed OEM cylinder bodies. Replaced I-R 30 grade iron with 45 grade iron and heavier wall sections in weak areas at a lower price and shorter delivery. Subsequent cylinders were made available in ductile iron at the same price after pattern and tooling and engineering costs were absorbed by initial cylinder purchase. OEM price was quoted lower than ACI price but invoice was $10,000 higher to reflect 45 grade iron. Quoted price was based on 30 iron. Customer was very irate. OEM high stage cylinders failing on a consistent basis. New cylinder design to eliminate failures and maintain major piping connection locations. New cylinder geometry eliminated the stress concentration factors associated with the OEM design. Design simplified service function and extended valve life. The ACI designed cylinders were less expensive — so much so that the OEM refused to submit a quote. New cylinder has run for over 18 years. Original designed cylinders were only for the 5th stage. Customer came back to have 4thstage cylinders redesigned in same fashion as 5th stage cylinders. Later, they wanted to have 3rd stage done also. However, due to the tandem arrangement, this was not possible. So, ACI designed a semi-four valve arrangement that simplified valve maintenance and eliminated the personnel hazard associated with the OEM’s design. Again, the OEM declined to offer a bid on these cylinders. A total revamp of the refinery process resulted in the obsolescence of all cylinders previously used on two different integral angle compressor units. Customer required 10 cylinders in a platform service and three cylinders for a platform service on OEM integral angle compressor units. In addition, two cylinders were required for an OEM integral angle machine for a D.U. Recycle service as well as the revamp of two existing cylinders on the OEM unit which were to be utilized in a D.U. Booster service. The two different services on the I-R engines required substantially different bore sizes to accommodate the specific flow rates for the two services. Since the compression ratios of the two services were not high, fixed clearance did not have a major influence on cylinder sizing. As a result, both services utilized a common body with different liner bores. The use of a slip fit liner offers the customer maximum flexibility. The ten inch liner bore, platform cylinder utilizes a filler piece in the front head which is omitted from the front head of the unifiner service. The filler piece is used as a potential clearance adjustment for the ten inch bore cylinders and permits the addition of an insert to the 8-7/8 bore cylinders to reduce fixed clearance. The ductile iron cylinders were fitted with a full complement of a unique design, failsafe, suction valve bypass unloaders to permit loadless start up and shutdown. Cylinders were of a non lubricated design and were provided with distance pieces to accommodate piston rod oil dams. While the larger bore I-R cylinders were of an eight valve configuration, the new D.U. Recycle cylinders for the Worthington engine were of a four valve design. These cylinders attached directly to the existing distance pieces and maintained the centerline of crank to centerline of suction and discharge flange location that was associated with the original cylinders. The new cylinders featured the same type of suction valve bypass unloader. These cylinders were also of a non lubricated design. Because it is a refinery application, cylinders were produced to API-618 specifications. Some ten years after installation the cylinders continue to meet the customers performance expectations from both a thermodynamic and mechanical stand point. Customer owned four throw nine inch stroke, DeLaval units previously in a natural gas BTU stabilization service were to be re-cylindered for natural gas injection/withdrawal service. The availability of existing low pressure wells created a natural storage cavity for a natural gas storage/withdrawal operation. In order to take advantage of this facility, very versatile and flexible compressor equipment would be required. New custom designed cylinders were created for the application. The range of operating conditions was such that, in addition to double acting operation, single acting operation would be required. In addition, fixed volume bottles over valves were required. The single acting capability was facilitated through special porting in the body and front head which, with the application of a large plug valve in the front head, permitted the connection of the head end compression chamber with the suction gas passage. The result was the ability to provide the required flows in both operating modes with small unloading steps without exceeding rod loads. ACI supplied crossheads to replace those which were required to duplicate the majority of those used in the previous application. The OEM was going to apply some non DeLaval cylinders which provided no single acting capability. The OEM would not provide new crossheads which meant that not all compressors would have the same weight. A built in service problem. Without single acting capability, performance would be compromised. Customer was operating multi-stage hydrogen compressors in a refinery that compressed a gas which was hydrogen rich. Flow requirements changed in more recent times and in addition load requirements had become more variable. To meet the ever changing flow rates, new capacity control equipment was required. In some applications, the working pressures approached 3500 psi. Unloader bodies were primarily machined from block forgings. Volumes for the unloaders were sized by ACI to meet customer flow specifications. All seals were special designs and materials to address the difficult gas analysis, temperatures. Unloader assemblies ran for many years in continuous duty before requiring seal replacements. Customer required the reapplication of large horsepower integral engines and compressors. The range of ratios required a reduction of existing fixed clearance. The customer was on a tight budget and required reuse of as much hardware as possible. ACI reconfigured front and rear heads and liner ports to reduce fixed clearance. Valves were redesigned to maximize lift area and minimize fixed clearance. A multiplicity of fixed volume unloaders provided the flexibility necessary to meet the wide range of compression ratios associated with the new application. Novel piston designs permitted the use of existing rods while providing piston to rod attachment features which result in reduced torque values for assembly. The revamped units provided the required performance. The OEM approach would not have matched that provided by ACI. In addition, the customer would have been saddled with the archaic piston to rod attachment features associated with OEM design. Customer has large integral angle compressor units with infinite step capacity control devices over compressor valves to effect the desired load and capacity control of the units. The system was basically a one of a kind system and the OEM no longer made replacement parts available. Maintenance of the valve plate depressors required specialized skills which also are not generally available. A suitable replacement system that would provide the required capacity control and one that would be simpler in design and easier to service as well as being more thermodynamically efficient. Replace infinite step capacity control system with appropriately sized fixed volume capacity control devices. These would include front head and valve pocket fixed volume unloaders. Existing front heads were checked to determine the interior volumes. These volumes were available for use in the capacity control systems. Utilization of the existing heads reduced the customers cost of the revamp. The multiple, valve-cap pockets, each provided with strategically sized volumes created an unloading schedule that minimized the step size associated with the opening and closing of the individual pockets. The deviation from an infinitely variable flow rate by the fixed volume pockets is more than offset by an increase in compression efficiency. The infinite step system is associated with very substantial back flow losses when the suction valves are held open to reduce capacity. Performance of the units has demonstrated that the desired capacity/load control has been accomplished along with the improved efficiency. Customer was operating integral angle compressor units that were experiencing excessive valve losses. Replacement cylinders with larger valves and with more modern design concepts and resulting in simplified maintenance features. ACI remanufactured customer selected used cylinders to replace the existing inefficient cylinders. Some of the used cylinders proved to be defective and new ones were no longer available from the OEM. ACI produced new functional equivalents to satisfy the customers needs. Both remanufactured and new cylinders were provided with appropriate capacity control equipment and remanufactured valving. New piston assemblies feature TFE rider rings and piston rings. Packing cases were reworked as were rods, where possible, and new rods supplied as required. After more than ten years of service, the cylinders continue to provide the customer with satisfactory and efficient service. Customer had a need for an increase in capacity at a station whose future was uncertain. Management was contemplating the removal of the station from service in the years ahead. The existing cylinders were at the maximum size offered by the OEM. The OEM’s solution required the use of the next larger class of cylinder. This approach would necessitate piping and pulsation vessel changes and perhaps an analog study. A low cost solution to the need and one that maintained the existing piping. Working with the customer, a design was developed that safely overcame the limitations of the existing cylinders and permitted the creation of a bore size beyond that established by the OEM as a limiting size. The new design made the use of rider rings a possibility and a special piston nut permitted the use of the existing piston rod. The original valving was maintained and the installation time and cost was minimal. Now, almost 20 years later, the cylinders are still in operation and the customer is considering more conversions. Customer ordered four additional cylinder conversions (along with other unloading changes) to maintain their commitment to improving station performance. Customer operating integral angle I-R units in a multi stage injection/withdrawal service using cylinders equipped with an infinite step capacity control system. The inherent inefficiency, high cost of maintenance and unavailability of replacement parts required an alternate means of accomplishing the same capacity control function. The application of fixed volume unloading on both stages provided a dramatic improvement in efficiency, maintained interstage pressures, kept rod loads within unit ratings and greatly simplified maintenance. Customer had the need to compress large volumes of a hydrogen and methane gas mixture. Because of the range of operating conditions, capacity control equipment would be a major factor in the machines performance. Two stage motor driven compressor units to satisfy customer specifications. ACI utilized two throw, seven inch stroke compressor frames supplied by the Superior Division of CES and attached custom engineered cylinders of a valve in head design which resulted in low fixed clearance and good gas flow to the valves. The head to body seal was of a unique design that eliminated flat fiber gaskets. The seal design provided a total seal against the hydrogen rich gas and assured that pressure testing with helium would be no problem. Slip fit liners, custom designed pistons that facilitated assembly of rider rings, multi-stud rod to piston attachment are among some of features incorporated in the cylinder design to facilitate service if and when required. In addition to multiple fixed volume unloader pockets, the front head was supplied with a unique actuator device that provided control for both a fixed volume pocket and a bypass system that deactivated the head end of the cylinder when energized. Customer requirement for ethylene gas at elevated pressures without contamination from hydrocarbon type lubricants. Single stage compressor unit to compress ethylene gas using a food grade lubricant. ACI selected a two throw, six inch stroke Superior frame and applied two custom engineered, four valve cylinders. Distance pieces and oil slingers on the piston rods prevented the migration of crank case oil from the sump into the cylinders. The cylinders featured all of the advanced design features associated with ACI cylinders and related components. The cylinders, with the use of new large bore liners readily offer an increased throughput to meet the customers future requirements. Customer’s existing cylinders were constantly under attack from the extremely corrosive nature of the gas being compressed. Cylinder life norm was 3 to 5 years. OEM offered no assistance in resolving the problem and customer attempted to produce replacement cylinders of the same geometry in a ni-resist material. The cylinder geometry and jacketed design were not compatible with ni-resist foundry practices and requirements. The customer required a functionally equivalent cylinder design that would directly replace the existing cylinder to the extent that all other parts of the assembly could be used with the replacement body. ACI modified the exterior of the cylinder body to simplify and enhance foundry procedures. Core support and clean out and pattern orientation in the mold resulted in sound castings when produced in a 300 series stainless. The new design improved and simplified inspection techniques and improved the ability to make weld repairs. Ultimately ACI produced other cylinder components, exposed to the compression medium, in stainless materials. The change from cast iron to stainless steel resolved the corrosion problems and eliminated the need for periodic inspections that cast iron cylinders required to avoid dangerous failures. The units have become more productive and maintenance costs have been reduced. This type of conversion has been applied to many cylinder sizes and geometries. Customer experienced a crack in a cylinder in hydrogen service. Loss of the cylinder would curtail plants production of gasoline. OEM replacement cylinder delivery time was unacceptable. A replacement cylinder on a temporary or permanent basis was needed to serve as a backup until an OEM cylinder became available. With no duplicate cylinder on the used equipment market, ACI selected a used cylinder produced by the same OEM that did not include API-618 features. ACI modified the cylinder to meet all API-618 requirements. The modified cylinder is a functional equivalent of the cracked cylinder even though the individual components are not interchangeable. The ACI cylinder matched flange connections and crosshead attachments. The cylinder was supplied in a shorter time and a lower price than that of a new OEM replacement cylinder. The ACI cylinder provided the needed back-up to avoid an untimely shut down due to an OEM cylinder failure. The ACI cylinder, if it was needed, did not compromise the customer’s specifications and safety requirements. The piston in the customers first stage hydrogen service experienced excessive wear and in some cases structural failures. Designs by other aftermarket suppliers provided no improvements. Customer asked for a design with infinite structural life and wear life that would permit a minimum of two years wear life of piston rings and rider rings. An improvement in wear resistance of the rod was also required. The ACI piston design incorporates a combination of steel and aluminum to meet the needs of weight control and wear resistance. Piston rider rings are of the heavy section, rubber band style. When installed, they are virtually an integral part of the piston component onto which they are assembled. Piston rings are of a heavy cross section and angle cut snap ring design. Rider and piston rings are of non-metallic materials. Piston rods feature a wear resistant coating. Piston to rod attachment is of the multi-stud design that simplifies piston assembly and disassembly. Recent discussions with the customer indicate that the experience to date predicts a six year life of wear components. Structural integrity is unchallenged. Customer’s well head pressure was declining and as a result oil flow rates also were declining. Customer was recylindering an existing integral engine to provide the required high pressure natural gas to boost the oil field pressure. A suitable final stage high pressure, 10,000 psi cylinder was not available on the used equipment market and the customer rejected new cylinder offerings which featured a tail rod design. ACI offered a single acting design which operated only on the crank end. Suction gas pressure was maintained on the head end and thereby assured piston pin bushing load reversal. A unique piston rod and rod nut design provide cylinder end clearance adjustment that will permit the last stage cylinder respond properly to changes in previous stage unloading. The design and manufacturing details were developed in conjunction with the customers engineering personnel. Customer had large volumes of a gas mixture, which was primarily comprised of carbon dioxide, available for use elsewhere in their system. The gas was to be delivered at a pressure of 1580 psi. An existing Worthington motor driven frame and cylinders that was available in the customers facilities appeared to be a candidate for the new application. In addition to determining the suitability of the unit for the new application, the customer wanted to determine the cost of the revamp and the practicality of the new hardware. The first stage cylinder proved to be the controlling factor in determining the suitability of unit for the new application. The first stage bore was substantially larger than required by the new specifications. Given the fact that the existing bore was in good condition, it was decided to use a heavy wall liner to create the required new bore size. The new liner featured a clearance fit with the old bore and was held in place with a unique spring arrangement. An equally unique seal system permitted the use of the existing lube oil porting in the old liner to deliver lubricating oil to the new bore. A new piston assembly was created for the new bore along with appropriate unloading to assure that interstage pressures met the new computer generated performance. The designs were produced in a manner that allowed the conversion to be accomplished in the field without the need of re-machining or special tools. The start up was smooth and the performance matched the predicted values. The project cost was well within the customers budget. A packager sold a packaged compressor unit for application in a hops processing plant. The process required a substantial volume of oil free CO2 gas. Two stages of CO2 compression picking up suction at the first stage and discharging at second stage. Operation was to be without lubrication. ACI provided engineering drawings to permit the customer to manufacture the complete cylinder assemblies for both stages. Because of process requirements, the cylinders and other components in contact with the gas also stainless materials. The cylinders were assembled to a new OEM frame and packaged and delivered by ACI’s customer. The start up suffered minor difficulties due to customer piping changes and the ingestion of solid material at the first stage suction. Additional problems were caused when unqualified valve plates were used to replace the original plates which were damaged by the ingested foreign material. After these start-up problems were resolved, the units operated in a flawless manner. The customer had purchased several five stage, single throw, 3000 psi air compressors from an OEM. These were skidded and incorporated with portable air separation plants. Mechanical problems with the compressors proved to be highly resistant to repair or modifications that would permit them to operate in a reliable manner. Because of the air separation plants remote locations, reliability and ease of maintenance were essential characteristics of any new machines. They needed to be of an uncomplicated design and of a configuration that would be readily understood by service people with even average mechanical ability. ACI selected a five stage, two throw machine configuration. The frames were purchased from a major OEM. The first and third stages were coupled on one side of the frame and the second, fourth and fifth were coupled on the opposite side of the frame. While the fourth and second stage pistons, like the first and third stage pistons, were rigidly attached to each other, the fifth stage piston had a loose attachment to the second stage piston. This cylinder arrangement was a major departure from that utilized by the OEM whose machines we replaced. All stages featured non-metallic piston and rider rings, slip fit liners and fastener types and sizes which could be serviced with standard socket, box and open end wrenches. Pliers are not acceptable. Our customer laughingly complained that he had one major problem with our cylinders — no replacement parts sales! He admitted that it was a good feeling. After completion of the first unit, a second, smaller size machine was produced. Multiple units of each size machine were produced over the years. Customer’s attempt to obtain gas transmission cylinders to re-cylinder existing engines met with no response from the OEM. Customer required six gas transmission cylinders to re-cylinder three medium speed integral angle engines. The required delivery was eleven weeks – an extremely short time interval. A substantial amount of unloading and special performance curves along with complete manuals and parts lists and assembly drawings were required. ACI sized, designed, manufactured, tested, assembled and shipped all six cylinders within eleven weeks. The final five were produced after the first body casting was machined and tested to assure dimensional compliance and validity of foundry techniques. All cast components followed the same 3 procedures — a standard ACI practice. All facets of the cylinder assembly design were in accordance with the ACI standards for gas transmission cylinders. Subsequent to producing the group of six cylinders, two more orders were received for two cylinders each. All cylinders operated trouble-free. Customer experienced an increase in natural gas supplies which they could make available for industrial and residential use. Customer required the installation of three integral engine compressor units to provide the necessary capacity to deliver the available natural gas. Capacity, pressure and capacity control requirements dictated the design of new compressor cylinders. Each engine was equipped with three cylinders. Each cylinder featured multiple clearance pockets. In addition to the pneumatically, actuated volumes, the segmented piston design offered the ability to vary the cylinder fixed clearance through alternate assembly arrangements of the piston segments. The head and crank ends or the piston assembly can be adjusted independently. These features offered the user the flexibility required to meet a wide range of operating conditions. Cylinders were provided with slip fit liners, non-metallic piston and rider rings, multi-stud piston to rod attachment, ExactoTorque nut to tighten rod to crosshead connection and other advance features associated ACI gas transmission cylinders. The cylinders have provided trouble free service for many years. All specification requirements were met. Customer installation involved a number of integral angle engines. Flow requirements changed over time and further lacked sufficient capacity control equipment to meet expected variations in flow requirements. The customer required eight replacement cylinders and capacity control equipment to responds to new flow requirements and the variations in flows expected. The production of eight, eight valve, ductile iron cylinders to satisfy the new flow conditions and capacity control equipment for both the new and existing cylinders which were not being replaced. Since the units were two staged with each stage discharging into their respective common headers, the location and operating sequence of capacity control equipment was especially critical. This fact had been overlooked by other potential suppliers. The order was obtained on the basis of price, delivery and the engineering detail. The new cylinders and the total capacity control packages demonstrated the integrity of both the hardware and the engineering analysis. The customer had an existing integral angle compressor engine with cylinders which no longer served the stations requirements. The customer wished to re-cylinder the engines with appropriately sized cylinders and related capacity control equipment. The desire was to apply the ACI Services patented Four Poster Cylinder. The cylinders were offered with special valve pocket adapters that would permit the use of either ACI poppet valves or the valves associated with the old cylinders. The adapters were sized so that the cylinder fixed clearance would remain a constant value regardless of valves utilized. This was a customer request. The cylinders used in this application were the same as those on two different size engines. In each case, the cylinder is fitted with specific cylinder to crosshead guide adapters, piston lengths and piston rod sizes and lengths. All mechanical and thermodynamic requirements were met. A reapplication of an existing four throw motor driven compressor unit rendered the original arrangement incapable of meeting the new demand. The customer needed two cylinders to duplicate two existing, identical cylinders. The four cylinders provided two cylinders for each of two frames for first stage service. In addition, capacity control devices were required to accommodate the predicted varying flow. ACI traveled to the job site to take field measurements of one of the existing cylinders which was to work with a new cylinder to serve as the first stage. Drawings, patterns, casting and machining resulted in the production of two complete cylinder assemblies. In addition to normal hydro tests, major castings were magnafluxed in accordance with customer specifications. Unloading was supplied to provide the capacity flexibility necessary to meet the predicted demand. The aluminum piston design associated with this cylinder was essentially a one piece cast design that utilized rubber band style rider rings. The piston design eliminated an integral rider ring stretch over diameter. The rider ring installation tool also served to form the slip over diameter which also closed the otherwise open end of the piston rider ring grooves. As a result, the installation tools are stored on the piston. Unit performance met the customers specifications and the machine performed without flaw. Delivery and price were less than those of the OEM. Customer has been operating cast steel compressor cylinders in a high pressure application. Welded on water jackets consistently cracked and resisted all attempts at repair. Replacement cylinders were required which eliminated the problems associated with the original design. To avoid the problems associated with cast steel compressor cylinder bodies, ACI Services elected to change the cylinder body material to forged steel to which water jacket covers were bolted. The use of the forged design did not detract from the interchangeability of parts associated with the body and jacket subassembly. The forged steel design of ACI Services totally eliminated the leakage problems associated with the OEM design. Existing cylinders attached to existing integral engines were unable to respond to the increased flow requirements of the system. The cylinders and engines were not manufactured by the same OEM. The customer specifications dictated an approximate 32% increase in bore size in a new cylinder that provided maximum operating efficiency. In addition, the cylinder was to have external dimensions that permitted the use of the existing piping system, cylinder supports and foundation. It was readily apparent that a conventional cylinder design would never meet all of the requirements of the specification. The OEM, who supplied the engines, agreed and offered a conventional design that did not meet the specifications. The ACI offering was sufficiently unique that a patent was received on the new design. In addition to meeting all the specification requirements, the cylinders were offered at a lower price and a shorter delivery than that offered by the OEM. In this design, all valves were accessible from the top of the cylinder and the front and rear head, piston assembly, liner and packing case were accessible from the front of the cylinder. Closed loop tests certified the efficiency of the cylinders. In the customers words, “This is the first job of this magnitude we’ve done that stayed within budget, got done on time and everything worked when it was installed. Nothing was missing and no parts were left over.” In addition, $1,500,000 was saved because of the re-use of the piping and cylinder supports and the absence of foundation changes. Subsequent to the supply of these 42 cylinders, other orders were received for four more identical cylinders and sixteen cylinders with slight modifications for another OEM’s engines. All cylinders delivered trouble free service. The existing cylinders on large integral angle engines, were unable to meet the flow and pressure conditions associated with the available gas. To meet the new conditions, the customer needed 15 inch diameter cylinders with a 1350 psi rating. Valving was to provide compression efficiencies associated with gas transmission requirements. ACI produced 15 inch diameter, nodular iron cylinders with a 1350 psi rating. Each cylinder had a total of 8, 10 1/8 inch diameter valves. Unloaders were placed over valves and in the front head. Segmented pistons utilizing a multi-stud to rod attachment and slip fit liners were incorporated in the design. Multiple orders were received for identical cylinders over a period of years.